As Christmas nears, pollution levels in New Delhi hit their worst this year in the past two days – earning a “severe” to “emergency” rating and indicating conditions that can spark a public health crisis. Christmas Day in the Indian capital is also forecast to be bleak. “Overall air quality in Delhi is in severe plus zone and it is expected to remain in the severe range until tomorrow. “It might not touch very poor levels thereafter,” System of Air Quality and Weather Forecasting and Research (SAFAR) said in its daily pollution analysis. On Sunday, New Delhi recorded the coldest morning in December, with temperatures dropping to 3.7 Celsius. The agency considered the drop in temperature a major cause for the pollution in the capital reaching “hazardous levels”. Senior government officials said the main reasons for the surge in the amount of toxic smog trapped over New Delhi were unusually cold air, including fog, and a lack of wind. This means that vehicle fumes, pollution from coal-fired power plants and industries, as well as smoke from fires being burned to keep people warm hangs over the city. Data from the government’s Central Pollution Control Board (CPCB) showed the air quality index, which measures the concentration of poisonous particulate matter, was an average of 449 on Monday, only slightly better than 450 on Sunday. The index measures the concentration of tiny poisonous particulate matter, or PM 2.5, which are less than 2.5 microns in diameter and can be carried deep into the lungs. The previous highest recording this year was 447 on June 15, when there was a dust storm. Anything above 100 is considered unhealthy. In some parts of Delhi, pollution levels hit 654 on Monday, among the worst recorded this year, and visibility in some parts of the city was just 200 metres, the weather department said. On Monday, 32 areas of the national capital recorded “severe” air quality, while five other areas recorded “very poor” quality air, according to the CPCB. Environmentalists said that inaction by the authorities was inexcusable and a concerted effort was needed to reduce pollution from vehicles and industry. “If this is not an emergency, then what is?” asked Delhi-based environmentalist Vimlendu Jha. The “severe” to “emergency” ratings mean that the air is not only hazardous for citizens with existing respiratory problems but can also seriously affect healthy people. Conditions are likely to remain severe on Tuesday, a holiday for Christmas. The PM 2.5 level may average above 400 and hit a high of 534 in some places, CPCB data showed. CPCB announced measures including shutting factories and a ban on construction sites in heavily polluted areas until Wednesday along with an advisory to avoid using diesel-powered vehicles. “The situation might improve slightly but is likely to continue in severe category until afternoon of December 26, when wind speeds will pick up and improve dispersion of pollutants,” said a task force headed by the CPCB. Steps this year have failed to make much difference and instead, there has been finger-pointing between Prime Minister Narendra Modi’s administration, the city government and the governments of states around the capital. The apparent lack of concern about the toxic air among ordinary people gives federal and local politicians the cover they need for failing to address the problem, say pollution activists and social scientists. During October and November, the federal government had blamed neighbouring states for failing to curb the burning of stubble in fields, but Delhi’s air worsened in December, data showed. India’s toxic air claimed 1.24 million lives in 2017, or 12.5 percent of total deaths, according to a study published in Lancet Planetary Health this month. “We are definitely seeing an increase in the number of patients with respiratory problems,” said Dr Desh Deepak, at the government-run Ram Manohar Lohia Hospital. The most recent air pollution data from the World Health Organization released this year gave India the dubious distinction of having the world’s 14 most polluted cities. 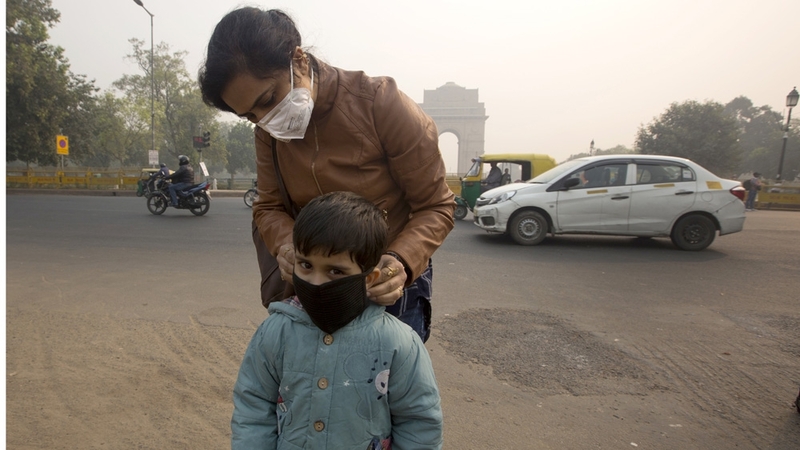 For a second year, New Delhi’s chief minister has likened the city to a “gas chamber”.